Several people have written—friends, readers, the morbidly curious—to ask when I am coming back, if A Commonplace Blog will resume normal operations, whether there is anything wrong. The truth is that my twin sons and I returned from our five-thousand-mile cross-country trip several days ago. Until now I have written nothing about the trip, not so much because I am no kind of travel writer (although I am not), but because the inhuman beauty of the American Southwest reduced me to silence. According to the National Park Service, the Paiute Indians told the story that the weirdly shaped “hoodoos” in Bryce Canyon were formed when the Legend People, who were not people but huge animals that looked like people, were turned to stone. But no matter how much I squinted, I could not see what the Paiutes saw. The landscape stretching from the Mojave Desert, which the boys and I crossed on the old U.S. 66, north through the Grand Canyon and up past Capitol Reef National Park, seemed the perfect setting for a science-fiction movie on another planet. 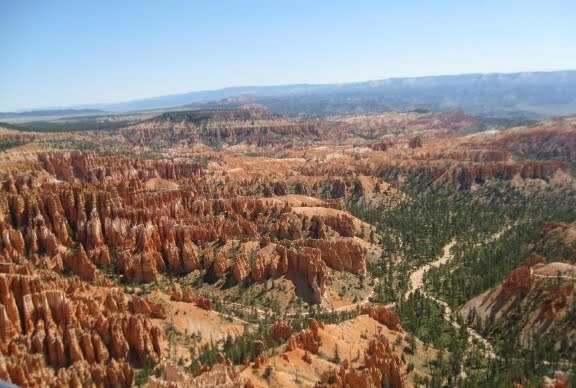 At a viewpoint overlooking Bryce Canyon, eighty-three hundred feet above sea level, a Dane pointed to the town in the distance and asked if I knew its name. “I want to retire there,” he said when I told him. But I couldn’t agree. I couldn’t imagine human life there. The sheer complexity of the geological history on display swallows up any thought of work or politics, makes humanistic speculation pointless. Now that I am back home, though, I have a lot of work to do—reviews of Roland Merullo’s novel The Talk-Funny Girl, which I have been enthusiastically recommending to friends and family, in person and tweets, Ron Hansen’s retelling of the Snyder murder case, A Wild Surge of Guilty Passion, which disappointed me, and a stack of new novels by women—Jean Thompson, Ann Patchett, Dana Spiotta—to get to. I have not been writing about them here, because next week A Commonplace Blog is migrating to a new host, a new venue. Although I can’t say anything more about the move right now, I am excited about it and the opportunities it will give me to reach a wider audience. Lecteurs fidèles! Just a few more days! Thanks for letting us know. We will wait for you to keep us posted. It sounds like you had a good time. I have twin sons, too. They're fourteen and a joy to have and raise. DG -- Glad to hear about the trip and that you've resurfaced. Thanks much for the update. I'll be sure to update the link I've placed on my blog to your new url when it becomes available. I also have young boys (three of them) and will do some cross country travel myself with them later this year. Best of luck to you with all of your projects and your work at Commentary's Contentions. I myself just started blogging about my cross-country road trip...it was 7 weeks ago. I've found that it's been much easier to do so retrospectively in the comfort of my own uncomfortable (but stationary) flat, and it's a great way to relive the experience, not just by sitting there trying to recall vague details, but by flipping through emails, letters, journal entries, and photos that were relayed/documented during the trip. Anyway, just found your blog and I'm excited to start reading. The American southwest--which I first began visiting ca. 1946--is indeed almost impossibly beautiful and awful, and I can't imagine a better way to see it than with one's own children, which I managed to do in 1979. And welcome home. Looking forward to what's coming. As to Merullo, I thoroughly enjoyed his Fidel's Last Days a year ago. Re your dismissal of Ann Patchett's State of Wonder on the Commentary blog: I've learned from and enjoyed your comments and appreciate that you've led me to authors such as Francene Prose, and Charles Willeford, and confirmed the high esteem I had for Charles McCarry. But I did not read State of Wonder as a paean to multiculturalism (albeit her Bel Canto may have bee). But I will follow your suggestion and read Prose's Primitive People to compare.